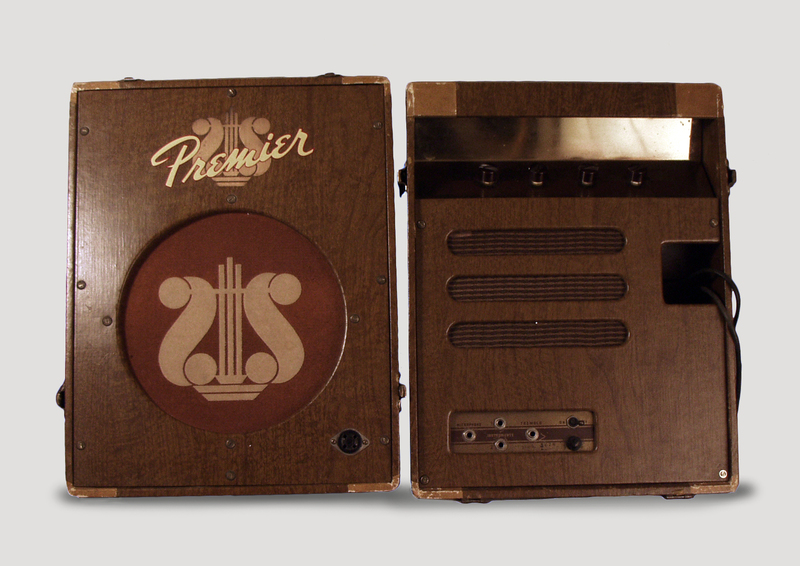 Premier Professional Model 76 Model Tube Amplifier, c. 1956, made in New York City, serial # 5670, two-tone fabric finish. One of the coolest and most interesting amp designs of its era, the Premier 76 is a very early example of a two-part amplifier with a stand alone speaker cabinet and separate power/control section. This would become common by the 1960s, but when this amp was introduced around 1950-51 it was still a radical idea. This was designed for guitar and accordion as a bandstand amp that could be configured onstage in several ways, with the controls facing either in or out depending on the stage set up. Premier also designed a clever slant-edged cabinet where the two halves locked together for convenient transport as a single rectangular unit. The amp itself is great-sounding with a deep, rich, jazzy tone, a very good early tremolo, and slightly kitschy cool period cosmetics. The fabric is two-tone brown and the knobs are brightly colored plastic, all typical of the company's signature look. 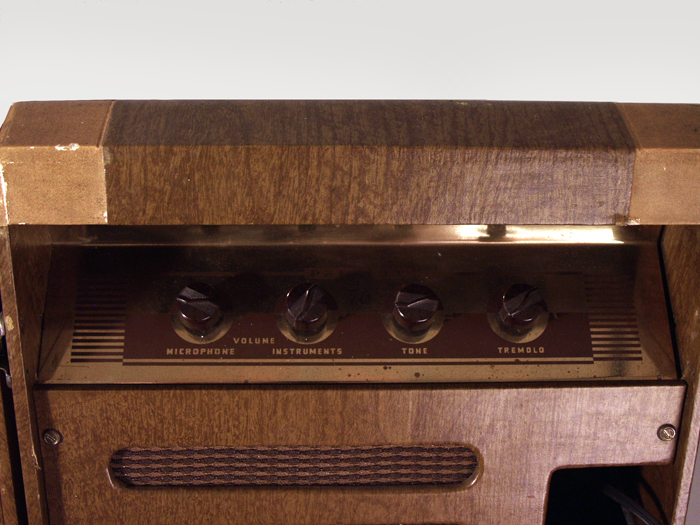 This Model 76 is a later example with a slightly smaller and lighter cabinet, introduced in the mid-'50s. This one carries pots dated to 1955 -- the amp was in production up through at least 1960, but is fairly rare today. These often under-appreciated Premier amplifiers, made in New York City, have been gaining attention recently as some of the most interesting (and distinctive) of their era. Height is 18 3/4 in. (47.6 cm. ), 15 3/4 in. (40 cm.) width, and 11 in. (27.9 cm.) . Overall this is a nice example of this fairly rare amp. There is some wear and tear to the fabric covering (mostly at the corners), but overall the outside is not overly worn. All knobs and major components are original; the tubes are mostly period with newer power tubes. The speaker has been replaced with a recent Fender Jensen; the sound is excellent. 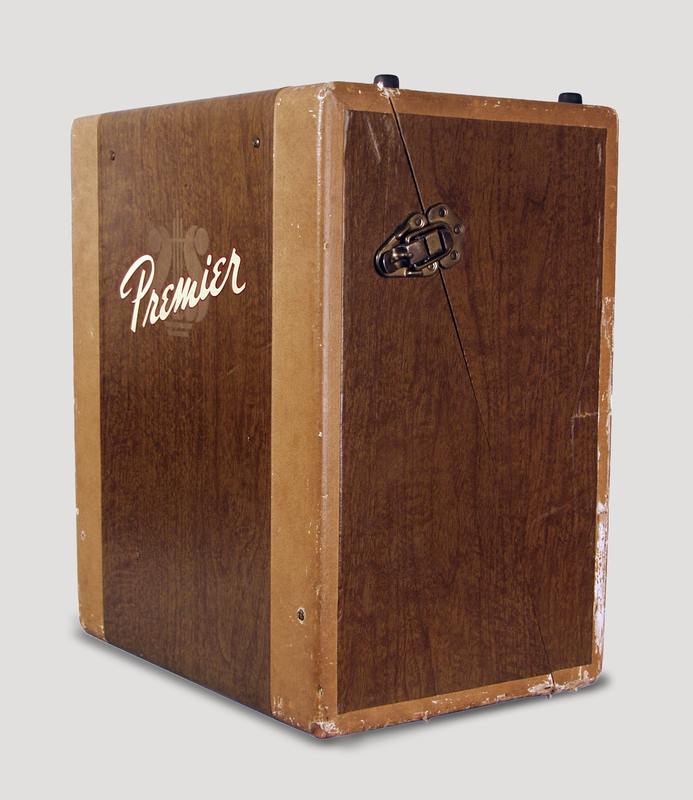 A cool and unusual '50s unit with a fairly dark, chunky sound, typical of these 1950s Premiers. Excellent - Condition.